I am doing everything I can to avoid a project I have committed to do. So why not post a new blog - that will postpone the inevitable. 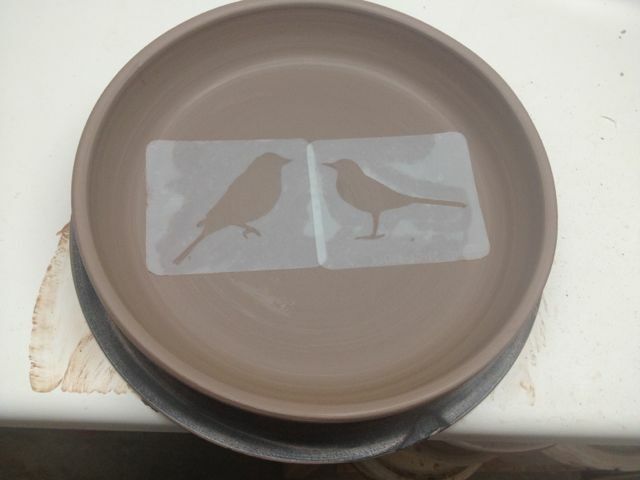 STENCILS are great fun ways to add images and detail to your work. They can be bought at- Michaels- Blick- Various Art Stores and online. They come in cheesy hearts and happy birthday all the way to high end sophisticated ones people use for airbrush tattoos and the like. Prices range from $1 to $35 for bigger higher quality ones. Some you will actually "recognize" they are so popular (yeck). 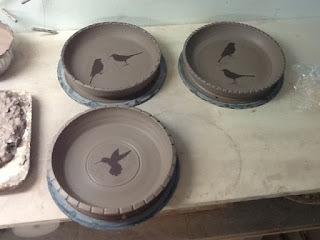 I like to use them on fresh thrown to pre-leather pieces ( you can use them on fired pieces as well) . 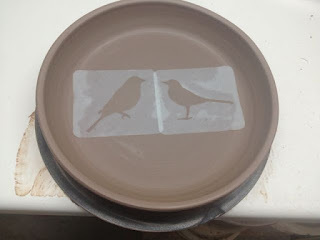 Here are a few tips on using stencils on clay-VERY BASIC- No DVD needed for this...Hmmmm maybe I could do that instead of my inevitable project. 1. 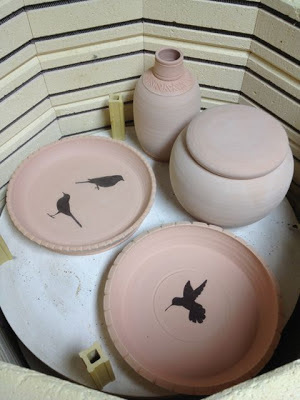 Apply to clay that still has some give/moisture - otherwise the stencil really won't stick and create a good seal - you will get bleed if it's not stuck on. 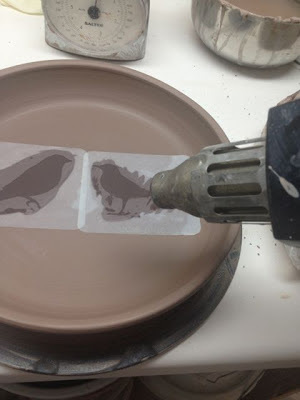 Press the edges in very slightly to get a clean line between the edge of the stencil where you will add color. 2. Use high quality underglaze or colorant/material. I prefer Amaco Velvet undergalzes- you can buy them in little tiny jars that are very handy and work well. 3. 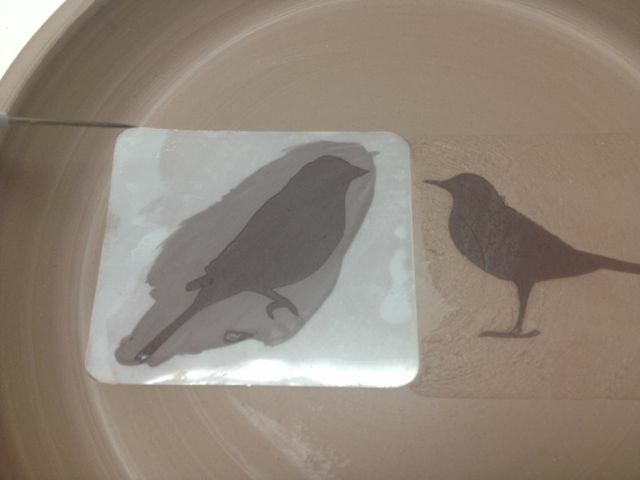 Let the painted-in area of the stencil completely dry before you remove the stencil. I use a heat gun on low to move this process along. A pin tool is great to pull up the edge to remove it. 4. Clean up any bleed or areas that need fixing using a small trimming tool or corner of a metal rib. You just want to gently scrape it off. 5. Don't touch it after it's on there - more mess ups occur by people monkeying with the edges. Those are beautiful. It looks like a fun technique. Good tips. 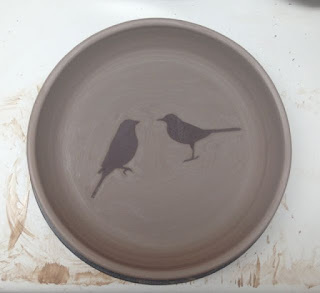 I've only used stencils a couple times and could have used the one about letting it dry before removing. Everytime I removed the wonderful spiral design It left splotches all over. Thanks.